Applying for car finance with bad credit is impossible – or is it? If your credit score is low and you’re looking for your next car on finance, you would probably think you would get declined straight away. In some cases, you would be correct. Loan companies see people with bad credit as more of a risk, this is because they have probably had problems repaying debts in the past. However, getting car finance with bad credit isn’t necessarily impossible! Depending on how low your credit score is, there are a few simple ways in which you can increase your credit score. If you’re not already on the electoral roll, get yourself on! It lets lenders know you are who you say you are and where you’re living. Also, have you ever checked your credit file yourself? It’s a good idea to check for any mistakes on your file, even having the wrong address could massively impact your score! If you’re trying to rebuild your score, make sure any payments you are making are made on time – it’s a great way to prove to lenders that you’re capable of managing your finances. Do your research before you apply for any car finance. If you know your credit score is low, making several applications and being refused can harm your score even more. If you’ve ever been refused car finance, you’ll know how disheartening it is so it’s really important to know your stuff before you start! There are a few types of different car finance agreements such as Hire Purchase, Personal Contract Purchase/Hire or Personal Loan. Have a look at your options before you start applying and see which one is right for you. For example, a Personal Contract Purchase is a good option for people who get bored of their car quickly and don’t have to worry about reselling the car when you’re ready for a change! Hire Purchase is more flexible when it comes to the end of your finance agreement as you have the freedom to decide whether you want to own or give back your vehicle. If you have bad credit, it may be because you had problems making payments in the past. When looking for a car on finance, make sure you can comfortably afford the repayments each month and make all your payments on time. You can use an online car finance calculator to calculate the loan you could be offered even before you apply! All you need to do is set your budget for the month, the duration of the loan and your credit score rating and then browse cars within your budget! 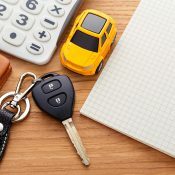 Getting car finance can be a really exciting time but be sure you’re making an informed decision! Be wary of anyone offering ‘guaranteed’ car finance with bad credit as they normally have high interest rates. You can also use your finance deal to improve your credit score if you honour the repayments made in your deal! If you’ve been accepted for car finance, you must read your credit agreement carefully. Some deals can include mileage limits, penalties for leaving the agreement etc. Make sure you’re getting the best deal possible for you!